MasonrySaver V.O.C. Compliant Solvent Base Water Repellent is an effective, penetrating water repellent in an effective, penetrating water repellent in a mineral spirits carrier designed to protect above grade masonry surfaces. It is designed to penetrate deeply in to most masonry and concrete pores and can be used as a clear sealant for brick and cement patios, a driveway sealer to water proof concrete, or other masonry surfaces. This VOC compliant silane/siloxane product comes with a 7 year warranty when applied to vertical surfaces. It can be used to retreat previously waterproofed surfaces as well. On cement patios where a sheen or “wet look” is desired, use our Paver Sealer. Note: This is a VOC Compliant product. The VOC content is less than 400 grams per liter and it can be sold in states that have adopted the California OTC standards. 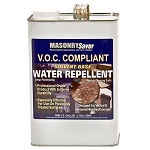 Due to these new VOC regulations, the sale of our regular MasonrySaver Solvent Base has been prohibited. So far, the states that have adopted these new standards include California, Connecticut, Delaware, Illinois, Washington D.C., Maine, Massachusetts, New Hampshire, New Jersey, New York, Ohio, Pennsylvania, Rhode Island, Vermont and Virginia (only in the counties of Arlington, Fairfax, Prince William, Stafford and Loudon). If you reside in one of these areas, you will need to use this VOC Compliant Solvent Base product. It works the same as the regular MasonrySaver Solvent Base with the following exceptions: it dries faster, it's only available in 1 gallon containers and it has a slightly different smell. Aside from the above three differences, VOC Compliant Solvent Base Water Repellent is applied in the same manner and has the same lifespan. Other waterproofing sealers form a film on the surface and trap water vapors, VOC Compliant Solvent Base Water Repellent allows deep penetration of its active ingredient of up to 1/4 inch or more. As a result, the special siloxanes in VOC Compliant Solvent Base Water Repellent react to form strong chemical bonds beneath a treated surface. These bonds allow the product to become a physical part of the structure and provide long-lasting water repellent protection without altering the surface appearance. Moisture, from either internal or external sources, is usually present in masonry and concrete. Film-forming sealers and silicone coatings form a water resistant surface that traps water vapors inside. If these vapors cannot escape, they will contribute to spalling, scaling, deterioration and freeze-thaw damage. VOC Compliant Solvent Base Water Repellent is 100% vapor permeable, a non film-forming water repellent that penetrates and lines masonry and concrete pores. With its mineral spirits base, VOC Compliant Solvent Base Water Repellent is an ideal maintenance product for previously treated surfaces as the mineral spirits carrier will allow the product to bond with surfaces that have previously been waterproofed.